Roughrider Electric Cooperative members have the opportunity to take part in Operation Round Up. Americans formed electric cooperatives across the nation in the 1940s. Since then, we have dedicated ourselves to improving the quality of life for people in our service area. One of our successful community service efforts is the Operation Round Up program. Through Operation Round Up, we round up a participating member's electric bills to the next highest dollar. For example, a member's monthly bill of $52.73 would round up to $53.00, with the extra 27 cents going to the Operation Round Up fund. We are able to donate roughly six dollars for each participating member annually. We then give that pool of money to a variety of worthy causes throughout our service area. It totals about $40,000 per year! 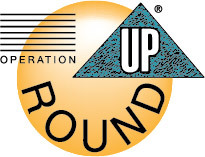 The idea for Operation Round Up began at Palmetto Electric Cooperative in Hilton Head, S.C., many years ago. Co-op leaders there saw a need to help communities and started the fund. Hundreds of thousands of dollars have helped many people over the years. And it's all with accumulated "change" on each electric bill. Operation Round Up is successful because of the generosity of our members. The Operation Round Up foundation board has two directors from each district and one at-large member. They are a seven-member board. With 8,000 Roughrider Electric Cooperative members, the money raised makes a big difference. We have distributed $472,000 since 2003. Worthy charities, needy individuals, and service organizations in our service area have all benefited. The foundation board meets twice a year to review applications and disperse funds. Examples include area fire departments, ambulance squads, schools, non-profit projects and other non-political projects. By just adding up a few cents each month, our consumers can contribute to many worthwhile causes. We encourage all members to take part in Operation Round Up and see the results your small donation will help generate. By giving a few cents each month, Roughrider Electric Cooperative members are making a big impact. The foundation board, the cooperative board and staff thank you for your participation. The program is voluntary. Call us, or send an e-mail to info@roughriderelectric.com if you do not want to be a part of this wonderful program.